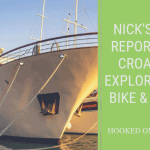 This bike and boat cycling holiday allows you to explore the Ionian Islands of Greece. The Ionian Islands off the west coast of Greece, shows her greener side, pure nature, the crystal clear blue shimmering Ionian Sea and centuries of Venetian influences dominate the archipelago of these Greek Isles. From Corfu, which was the dream island of the unforgettable Austrian empress Sissi, this journey will lead us to regions which are not very well known abroad. Discover the famous island of Ithaca which is said to have been the home of Odysseus, you will never forget the green bird sanctuary island of Lefkas, the fantastic mountain world of Kefallonia and the beautiful olive woods of the small island of Paxos. We enjoy our stay on board of the wooden motor yacht and let us be pampered by the excellent Greek cuisine. Check in on the ship from 2 pm on. Dinner on board. Overnight stay in Corfu town. In the morning we will crossover to Sivota. There our first cycle tour starts and leads us to Parga, the only centre of tourism on the western coast of the Greek mainland. Parga is a pretty town with the medieval fort which towers over the old town. Here the boat is awaiting us to take us to Nidri on Lekas Island. On our way we pass the original swing-bridge which connects Lefkas with the Greek mainland. Todays cycle ride takes us first from Nidri to a nearby waterfall. If you are lucky it will still have enough water for a refreshing morning swim. Then along quiet roads through the mountains past Sivros we cycle later to the harbour in Vasiliki. After a short sail we anchor at Porto Katsiki, one of the most famous beaches in Greece, for swimming. Then the ship brings us to Fiskardo on Cephalonia, where we spend the night. The harbour town on the Northern point of the island charms visitors with its colourful houses and numerous cafés and bars along the picturesque harbour promenade. Do not miss to taste the local Robola wine! Day 4 Cephalonia Island approx. 25 miles /39 km. Today’s cycle tour leads us from Fiskardo to Sami. We cycle along the impressive mountain pass at the eastern coast of the island. You will have lots of unforgettable views, like the panoramic view to the neighbour island of Ithaca. After a refreshing break we continue cycling. On the way we may visit the limestone (stalactite and stalagmite) caves of Melissani, which can only be viewed in row boats and charms you with electrifying clear water in various shades of blue. In the late afternoon we cruise to Vathy on the Ithaca Island. Ithaca, the homeland of the mythical king Odysseus is a hilly island with a beautiful landscape. On today’s cycle route we can enjoy the typical character of the Ionian Islands here away from the beaten tourist track: gnarled olive trees, crystal clear water and friendly islanders, time appears to stand still on Ithaca. From Frikes the Panagiota takes us to the small island of Meganisi. On the way we pass the private island of the influential ship owner Aristoteles Onassis. Meganisi is a tiny island with lots of charm, which we will explore in the afternoon in no time by bike. In the morning crossover to Mytikas on the Greek mainland. From Mytikas we will ride along the coast and further on panoramic roads, passing some mountain villages until we reach Lefkas town. In the afternoon we sail to Paxos island, whose unique natural harbor in Gaios creates a special island atmosphere. We can spend the evening in a cozy tavern in Gaios. Paxos, the smallest of the seven Ionian Islands is a grove of olive trees, which gives the island its wonderful silver green color. On today’s cycle trip we will circle the island. We can have our first swim in the Mediterranean on one of the many beaches. After lunch the boat brings us back to Corfu town, where, after dinner on board, you end your tour leisurely with an evening in the romantic historical town centre. Minimum number 14 persons, minimum age 10 and height above 140 cm. The route leads through hilly or mountainous areas on mostly asphalted and are rarely busy. Group return transfer between Corfu airport and harbour on arrival and departure days only £12 per person per way.